Creativation was an incredible adventure this year. I am always looking for that take away or that special something. I will breakdown all that happened in the coming posts, but being so busy when I returned, a vortex was created that has sucked time away faster then I could imagine. Josafine joined in one of our make and takes on the Creativation show floor. Her passion was ignited in the project and she fell in love with the products. Much to my surprise she inquired about any DT openings and I took a blind gamble and went with a guest post. Moments like this is why the Creative Arts industry is so wonderful, the unknown talent is limitless. I was thrilled and covered in goosebumps when she submitted a rough project photo. 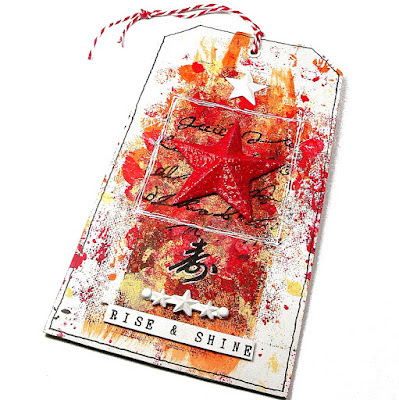 Please Check out Josafine's 'Simple' projects with emphasis on Fractured Ice Embossing powder by Emerald Creek & The Simple stamp from Kelly Klapstein's brush letting collection. I’m so excited to be guest designing for Emerald Creek today and I’m so grateful for this opportunity. 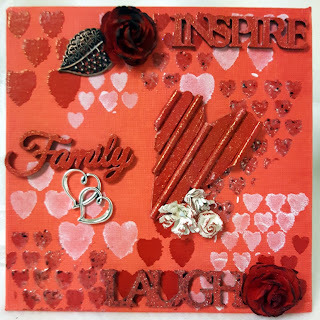 Thanks Kim for letting me create with your amazing products! I couldn’t stop myself, so I decided to create not just one, but two cards using the “simple” stamp from Kelly Klapstein. I think it’s a gorgeous font and even though the word might suggest a clean and simple card, I wanted to get a little messier with it. 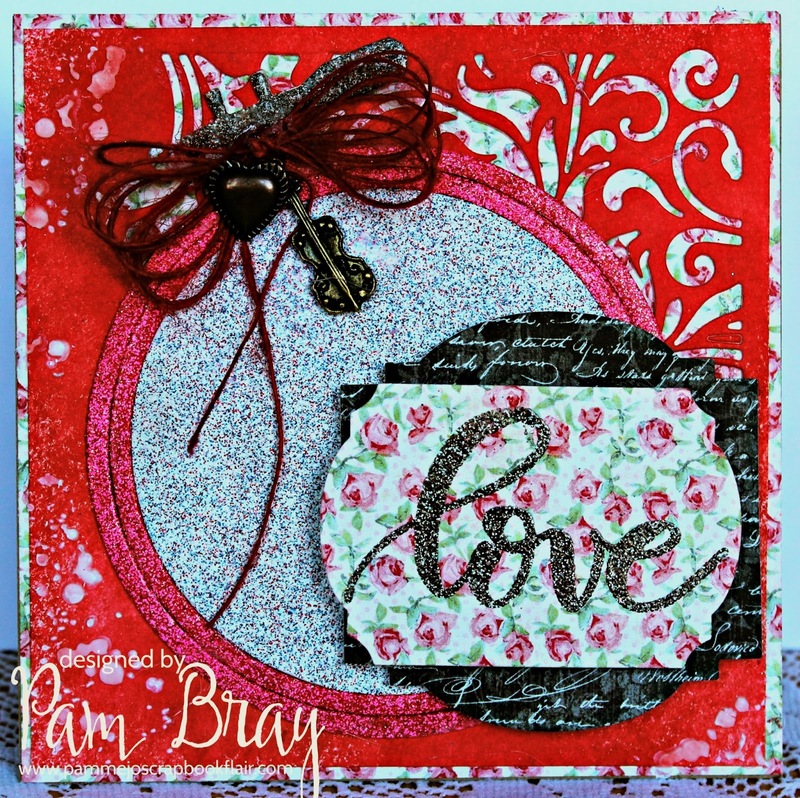 I started with creating some texture for one of the cards using a doily stencil and white texture paste. Thankfully, the paste dried fast, so I was able to mess around with some Color Bursts, creating two very different backgrounds. Then I stamped the “simple” word - one on vellum and heat embossed with Fractured Ice Crystals, the other directly on top of the paper and outlined with a black pen – and added some finishing touches by adhering a few gemstones to the card and wrapping white twine around it. with more Brilliance from the Design Team! Check out what they have created and then enter your own awesome Red works of Art. Well this piece is for my Emerald Creek family. For all the inspiration, all the support and a lot of laughs over the last year and a half. One of the best things I have been blessed to be a part of and contribute to. How can you not look at a Rose Stamp and not start singing about painting the roses red? I know I can't! This bunny key sealed the deal for me and this card was created. 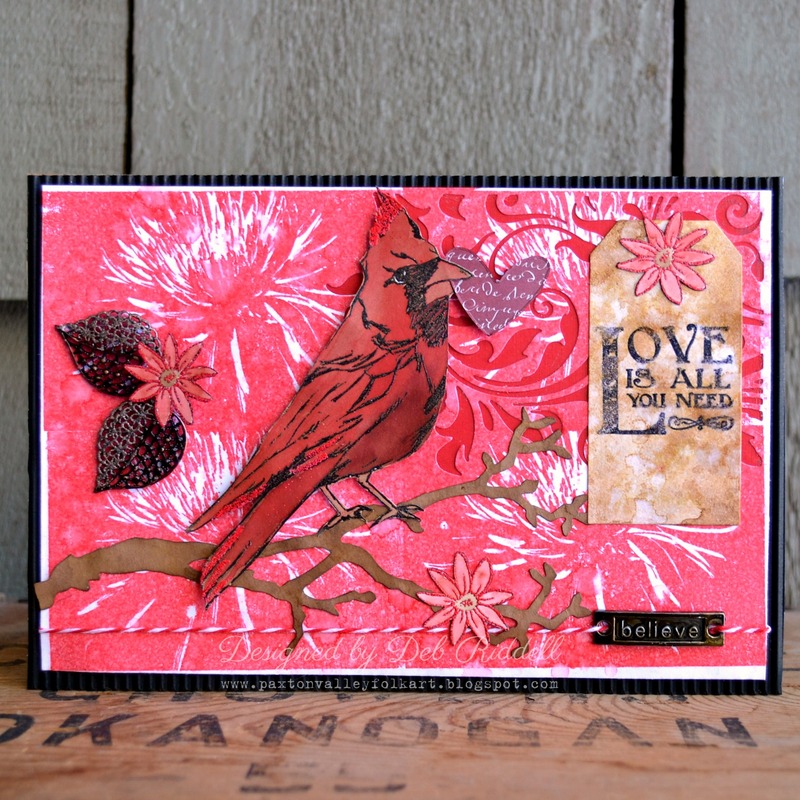 Red isn't a colour I use very often so I was struggling a bit with this Dare until I spied that wonderful Cardinal stamp from Emerald Creek in my stash! 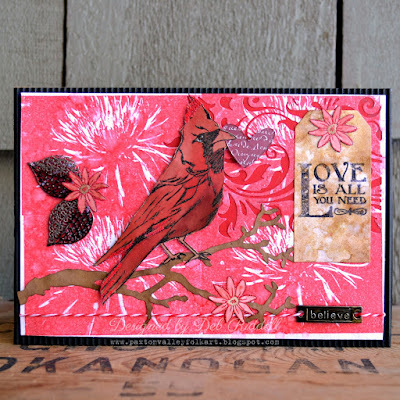 I channeled my inner Andy Warhol to create the background with the new Chrysanthemum stamp for my Love Is All You Need card, hope you can pop by my blog for the how to. Oh, how I love red! When Kim made the February Dare "Rock the Red", my thought was... Always! So I incorporated the word into an embossed and watercoloured card with a hug and a kiss from the EC Quarry. To enter this month's Rock the Red Dare, use the InLinkz below. Remember to follow the challenge rules as posted on the right sidebar of the blog, in order to be eligible. I have to admit I am behind in my updates and posts but I am really excited to be moving forward in 2017 and hopefully finding a bit of routine and rhythm. February is going to be packed with lots of love for all that Creativation offered last month and for the wonderful wrap up of 2016 in December, so make sure you follow and don't miss anything. BUT, in the spirit of moving forward we are going to be highlight all things Red. So bring your A Game and show us how RED inspires you this month. 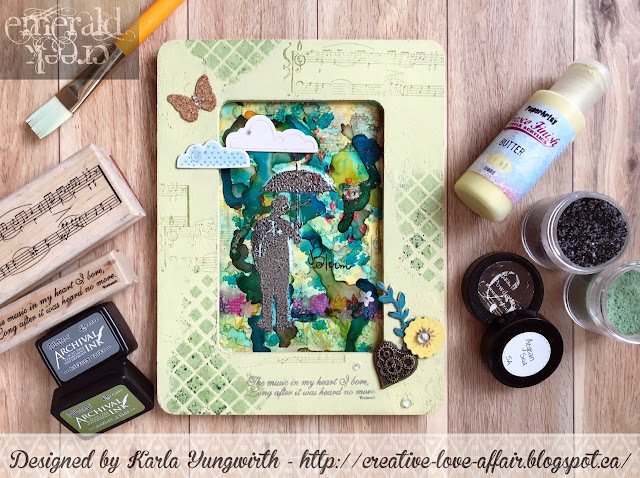 The idea for this tag popped up in my head when I found this beautiful background that was actually a scrap from a monoprinting technique I had used on another project some weeks ago. I just loved the patterns the paints had created on my paper - and red it was. 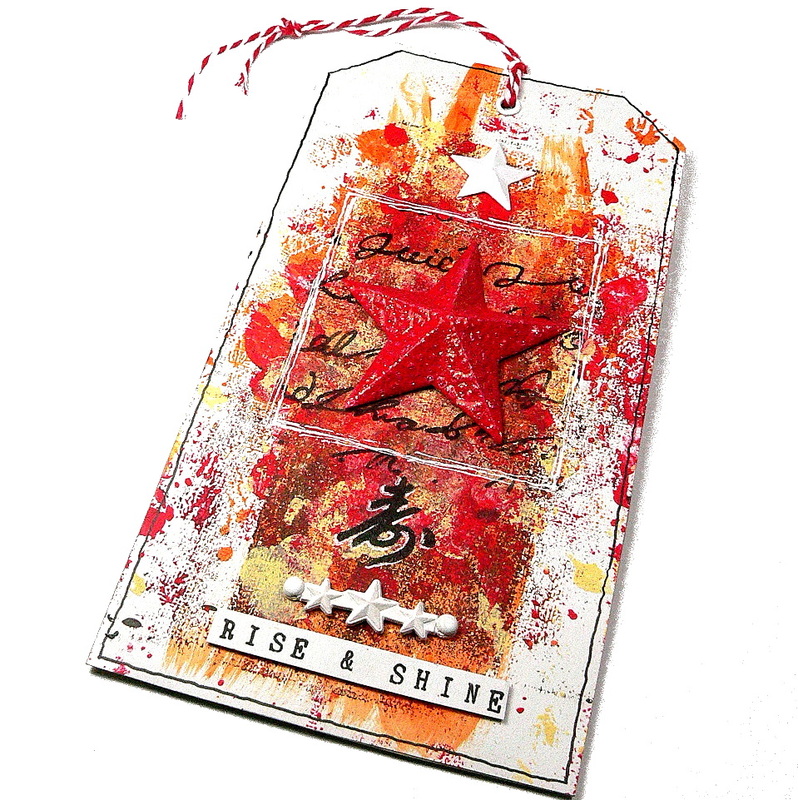 So I knew I had to use this for a big tag alongside the fab Chinese New Year Emerald Creek embossing powder! When I saw Kim's Dare this month to 'Rock the Red', my mind immediately turned to Valentine's Day! When I opened my package of new Emerald Creek goodies and saw this beautiful rose stamp, I knew it had to be front and center of my design! 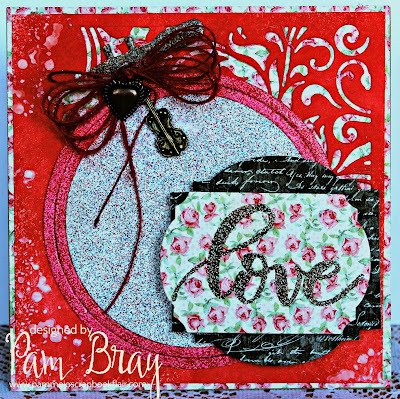 The Kimilese script stamp makes the perfect watery background, and the heart charm and brads the perfect embellishment for my Valentine card! 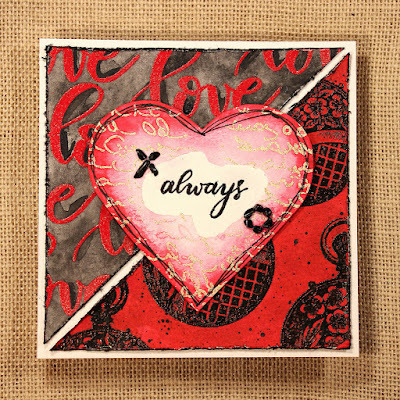 I got double the use from my script stamp by using it on the heart background, too! Gramofon z mini albumem (Turntable plus mini Album) entry. 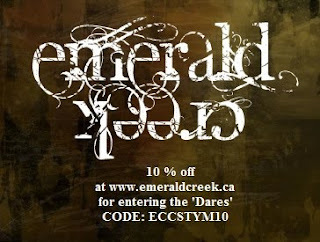 Agnes please email Kim at info@emeraldcreek.ca for your prize code.